I am considering a trek in August/September in the Mealy Mountains and English Mountains in Labrador (Canada's newest National Park; for info see 1, 2, 3). However, I am worried by the prospect of polar bears, so I wonder how frequent they are. Gros Morne National Park, almost 500 km south of the Mealy Mountains, rates polar bears there as accidental visitors (Occasional visitor, no permanent population). Torngat Mountain National Park, roughly 600 km north of the Mealy Mountains, writes on their website: Visitors travelling and camping in the park are in polar bear country and are at high risk of encounters. Polar bears are almost always present along the north Labrador coast. Where do the Mealy Mountains fit in during the ice-free season (August/September)? Are polar bears occasional visitors like in Gros Morne National Park, where it's arguably safe to hike without worrying about polar bears? Or are they closer to being permanently present, and is hiking alone without a guide very dangerous? Wildlife characteristic of the boreal forest thrives here: moose, caribou, black bear, red fox, lynx, snowshoe hare, wolf, spruce grouse, raven. Along the coast congregate seabirds and waterfowl: Atlantic puffins, murres, petrels, gannets, Canada geese, eider ducks, and black ducks, among others. Seals, whales and the occasional polar bear frequent the coast. 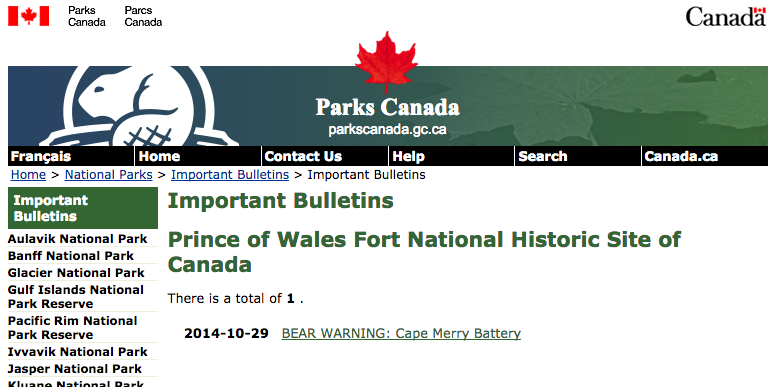 So the answer appears to be; there are polar bears near the coast on occasion, but not inland. Hopefully the park has enough of an infrastructure to post bulletins by the time you go on your trip, if not, then it would be advisable to carry effective, approved polar bear deterrents and know how to use them. Not the answer you're looking for? Browse other questions tagged safety bears polar-bears or ask your own question. How effective or ineffective are tactical flashlights on bears?